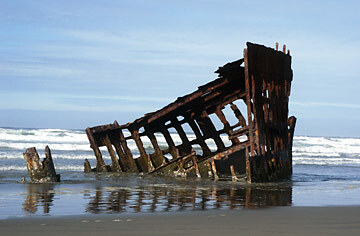 "Wreck of the Peter Iredale"
The 3 a.m. hour of October 25, 1906 was dark, windy and cold. The 275 foot long Liverpool sailing ship was struggling toward the mouth of the Columbia River on its way to Portland, Oregon. But its 25 crew and 2 stowaways weren't destined to make it there. Heavy mists obscurred the beacons of the light houses and the Columbia River light ship. 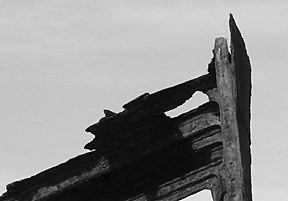 Soon the fated ship ran aground, and soon it broke off its top spars. 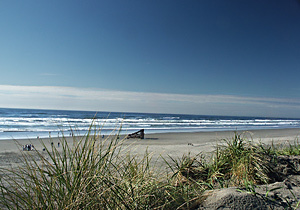 Then heavy rain squalls and a fresh westerly gale pushed it ashore, where it lies to this day, now a playground of Oregon beachcombers and children. Luckily, it is not a gloomy ship of ghosts and terror---everyone was rescued by a life-saving crew from Hammond, and later congenially housed by the men at nearby Ft. Stevens. The maritime inquiry absolved the captain (master) and his mates of any wrong action in the loss of the ship. 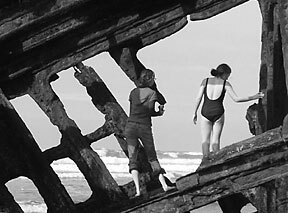 Please see page bottom for a link to five historic pictures of the ship in its prime. 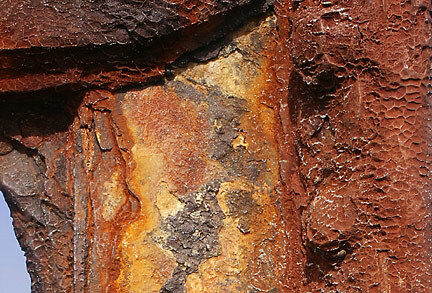 Salt water acting through the course of nearly 100 years has transformed spare utilitarian iron into abstractions of color and form. If you look closely at the protruding lump on the upper right, you can make out what is probably a very corroded nut and bolt!